When assigning and sequencing neoplasm codes in this scenario for metastatic prostate cancer to the lungs, you will need to know and apply the ICD-10-CM coding guidelines. Question: A 67-year-old male patient with primary prostate cancer with metastasis to the left lung presents for a wedge resection of the lung. Looking in the ICD-10-CM coding manual in the Table of Neoplasms, see Lung, Malignant secondary C78.0-. Verified in the Tabular, C78.02 refers to Secondary malignant neoplasm of left lung. To locate the code for the neoplasm of the prostate, look in the Table of Neoplasms under Prostate (gland), Malignant primary C61. Verified in the Tabular, C61 is Malignant neoplasm of prostate. Be sure to read all the instructional notes for any additional coding instructions. When a patient is admitted because of a primary neoplasm with metastasis, and treatment is directed toward the secondary site only, the secondary neoplasm is designated as the principal diagnosis even though the primary malignancy is still present. Therefore, C78.02 is sequenced first, followed by C61. According to the Mayo Clinic, prostate cancer is one of the most common types of cancer in men. 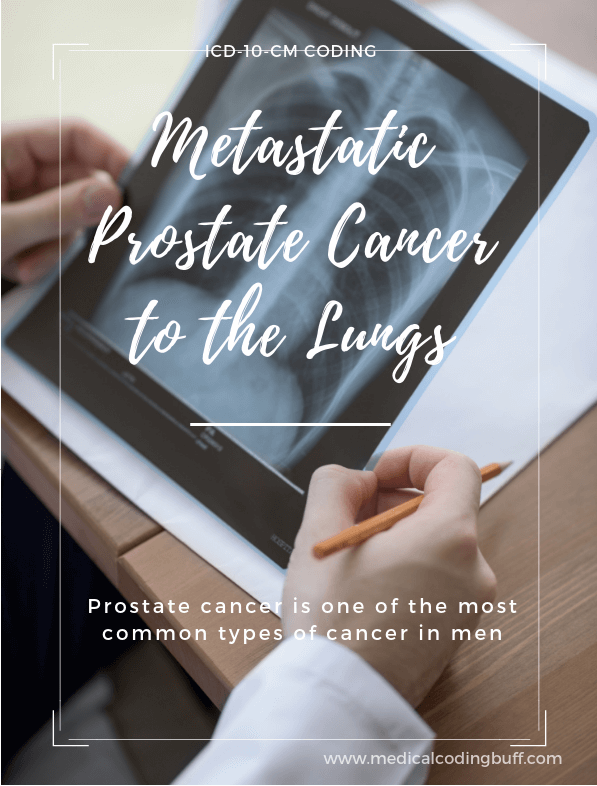 Although prostate cancer tends to grow slowly and usually remains confined to the prostate gland and requires little treatment, other types are aggressive and can spread quickly. Prostate cancer typically spreads to the lymph nodes and the bones but may also spread to the lungs, liver, and brain, according to the Mayo Clinic. It is rare for prostate cancer to metastasize to the adrenal glands, breasts, eyes, kidney, muscles, pancreas, salivary glands, or spleen. If you enjoyed this coding exercise, you may also enjoy this coding exercise about a malignant neoplasm of the left breast with metastasis to the liver.